Providence Sister Marie Kevin Tighe died on May 19 in Mother Theodore Hall at her order’s motherhouse in St. Mary-of-the-Woods. She was 89. Visitation took place on May 21 at the Church of the Immaculate Conception at the motherhouse with a wake service following. The Mass of Christian Burial was celebrated on May 22 in the Church of the Immaculate Conception. Burial followed in the sisters’ cemetery. Sister Marie Kevin served as the vice postulator of the beatification and canonization of St. Theodora Guérin, the foundress of the Sisters of Providence of Saint Mary-of-the-Woods, from 1996-2006. Now-retired Pope Benedict XVI declared Mother Theodore the first saint from Indiana on Oct. 15, 2006. Sister Marie Kevin was serving on a team of sisters to help renew the Sisters of Providence following the reforms of the Second Vatican Council when Providence Sister Denise Wilkinson, the order’s current superior general, was new to the community. In a 2006 interview, Sister Denise reflected on the influence that Sister Marie Kevin had on her religious formation, seeing her as following in the footsteps of the order’s foundress. Much of Sister Marie Kevin’s ministry to promote the cause of Mother Theodore may have never occurred, however, had she died after being diagnosed with gastroesophageal cancer in 1994. To combat the cancer, surgeons removed half of her stomach, half of her esophagus, her spleen and part of her diaphragm. She survived the ordeal, and lived to see Mother Theodore declared blessed four years later by St. John Paul II. Her battle with cancer gave her a perspective on her life and, ultimately, on her death. “I understand now in a way that I never could have before that my life, even if I live to be 99, is about one inch long,” Sister Marie Kevin said in a 2006 interview. “And on both ends of that inch there’s a long line—one that goes backward toward eternity and one that goes forward to eternity. Anna Therese Tighe was born on Aug. 23, 1924, in New Albany where she grew up as a member of the former Holy Trinity Parish. She entered the Sisters of Providence on Jan. 7, 1942, and professed perpetual vows on Aug. 15, 1949. Sister Marie Kevin earned a bachelor’s degree from Saint Mary-of-the-Woods College and master’s degrees from Indiana State University in Terre Haute and St. Louis University in St. Louis. Over her 72 years as a Sister of Providence, Sister Marie Kevin ministered for 24 years in schools in Illinois and Indiana. In the Archdiocese of Indianapolis, Sister Marie Kevin served at Bishop Chartrand High School (now Roncalli High School), St. Luke the Evangelist School and St. Philip Neri School, all in Indianapolis, and at the former St. Anne School in New Castle. 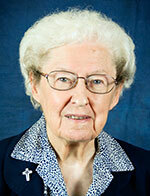 In 1968, she was elected to the Sisters of Providence’s leadership team. This led to her efforts to help renew the congregation following the Second Vatican Council. She later served on the formation staff of the former Saint Meinrad College in St. Meinrad and as director of the former archdiocesan Office of Pastoral Councils. Sister Marie Kevin was appointed vice postulator of the beatification and canonization of Mother Theodore Guérin in 1996, guiding the cause to its fulfillment in 2006. In 2009, she published Arch, Steeples, and Dome: Religious Symbols on a Journey of Faith, a book in which she reflected on the Church since Vatican II. Sister Marie Kevin is survived by several nieces and nephews.